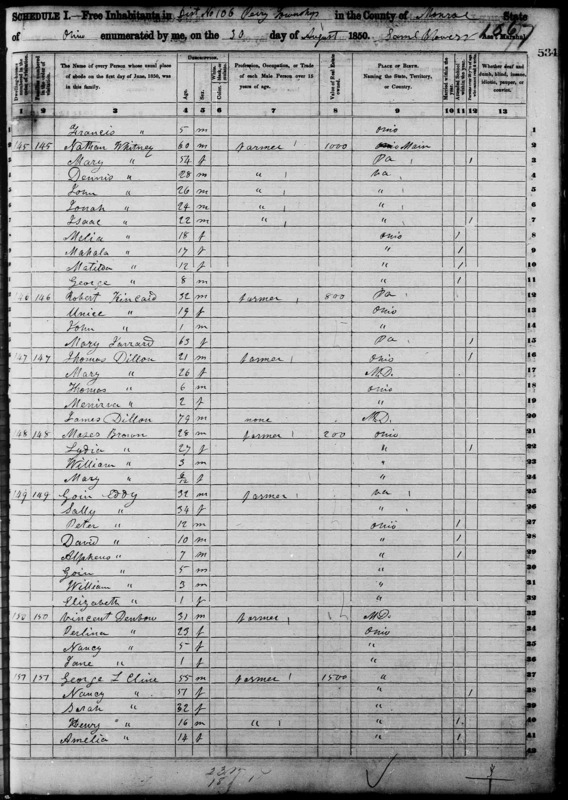 [S137] 1850 U.S. Census, unknown repository address, Knox, Twp 13N 1E Illinois, Dwelling# 1475, Family# 421, Year: 1850; Census Place: Township 13 N 1 E, Knox, Illinois; Roll: M432_113; Page: 406B; Image: 399. [S138] Denbow-Cubbage (Ind. ): Dodd, Jordan. Indiana Marriages to 1850 [database on-line]. Provo, UT, USA: Ancestry.com Operations Inc, 1997. Original data: Electronic transcription of marriage records held by the individual counties in Indiana. [S141] Cemetery Records of Soloman Denbow, online http://search.ancestry.com/cgi-bin/sse.dll, Ancestry.com. Iowa, Cemetery Records, 1662-1999 [database on-line]. Provo, UT, USA: Ancestry.com Operations Inc, 2000. Original data: Works Project Administration. Graves Registration Project. Washington, D.C.: n.p., n.d.
[S142] Iowa Denbow Tree by latulippe55, online http://trees.ancestry.com/tree/26504742/person/1856717320, Seems to have good, sourced information on Soloman and his family. Susan Denbow was born on 11 December 1895 at Pana, Christian, Illinois, USA. She married Fred Johnson on 23 October 1914. Her married name was Johnson. Susan Louisa Denbow was born in 1850. She married Nathaniel Salisbury on 5 September 1866. Her married name was Salisbury. Susan V. Denbow was born in 1897.1 She married S. Lewis Garrett in 1903 at Monroe, Ohio, USA. Her married name was Garrett. Sylvester Denbow was born on 1 February 1859. He died on 13 February 1902 at age 43. [S190] Thomas Denbow Will DNK. Thomas Denbow was born on 30 December 1858 at Monroe, Ohio, USA. He married Rosa A. 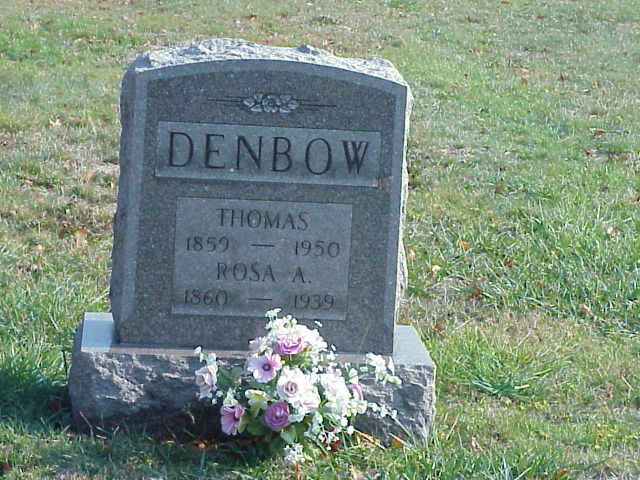 Love on 30 August 1879 at Noble, Ohio, USA.2 Thomas Denbow died in 1950. The back of the photo says: "My dad's Brother, Uncle Tom, Mother Denbow Hargis. Another line, in different handwriting, says: "Granpa Denbow." Thomas David Denbow was born on 9 November 1876 at Pleasant Hill, Dallas, Alabama, USA. He married Flora Sands on 3 December 1899 at Navarro, Texas, USA. Thomas David Denbow died on 2 September 1980 at Navarro, Texas, USA, at age 103. He was buried at Chatfield, Navarro, Texas, USA. Velma Pearl Denbow was born on 16 February 1906 at Roane, Navarro, Texas, USA. She married Edwin Jackson Holsomback on 11 October 1930 at Navarro, Texas, USA. Her married name was Holsomback. Velma Pearl Denbow died in 1985 at Corsicana, Navarro, Texas, USA. She was buried at Navarro, Texas, USA. Walter Denbow was born in 1880 at Monroe, Ohio, USA.1 He married Norah Montgomery in 1900 at Monroe, Ohio, USA. 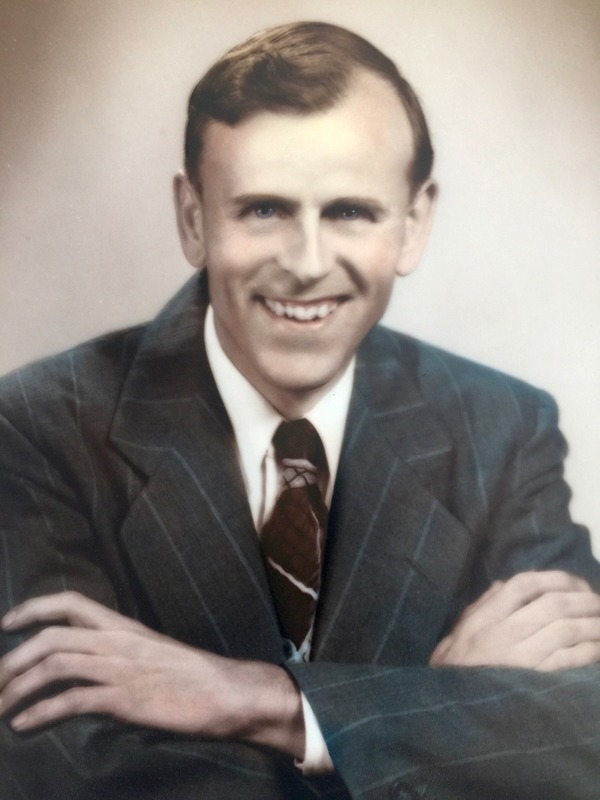 Walter J. Denbow was born in 1885. He died on 8 June 1964. Walter Rose Denbow was born on 20 June 1894 at Monroe, Ohio, USA. He married Pauline Gilman Richards on 4 June 1919. Walter Rose Denbow died on 14 May 1969 at Ohio, USA, at age 74. 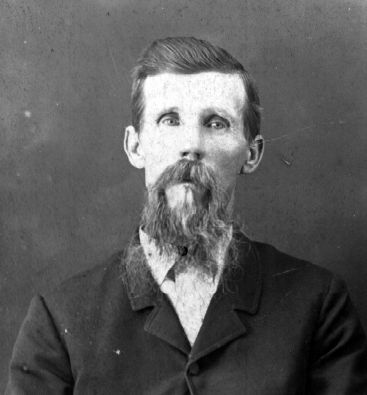 William Denbow was born on 25 April 1839 at Carroll, Ohio, USA. He married Anna Dillon on 12 November 1857 at Franklin, Monroe, Ohio, USA; Marriage ceremony conducted by Stephen Foreschea. 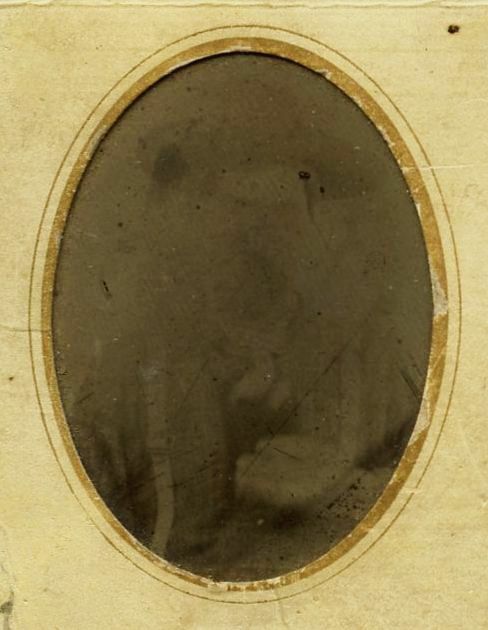 William Denbow began military service on 28 November 1861 at Co. K, 78th OVI.1 He ended military service on 11 July 1865; Uncle Billy, as he was called by family and friends, served virtually the whole length of the war and participated in the March to the Sea, the Carolinas campaign, and the Grand Review in Washington, D.C.1 He died on 3 February 1919 at Monroe, Ohio, USA, at age 79. 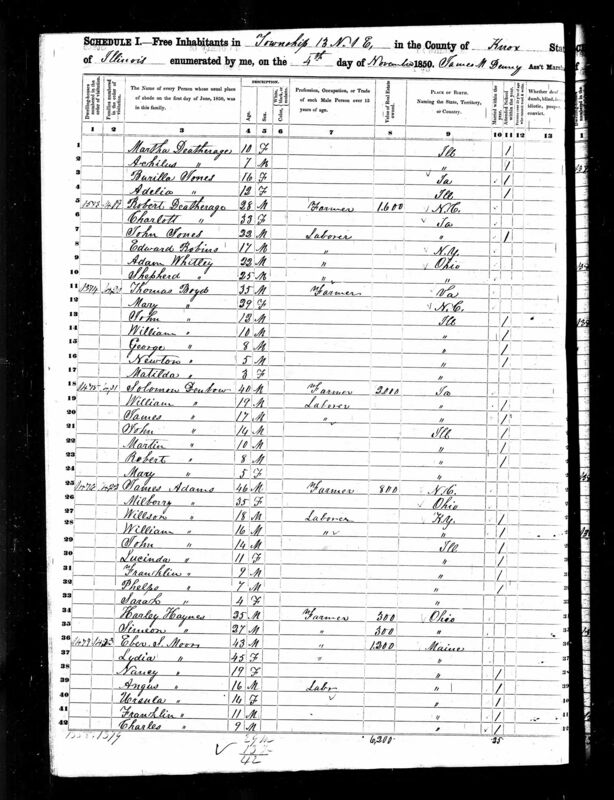 [S137] 1850 U.S. Census, unknown repository address, Knox, Twp 13N 1E Illinois, Dwelling# 1475, Family# 421. William Denbow was born in 1905. William Denbow married Kate Woods on 11 August 1902; Crowder,Missouri,USA. William Denbow Reference: Data from Gary A. Denbow. William Evan Denbow was born on 5 August 1878 at Franklin, Monroe, Ohio, USA. He married Elsie Gardner in 1898 at Ohio, USA. William Evan Denbow married Savannah Wright in 1909. William Evan Denbow was buried in 1960 at Lewisville, Monroe, Ohio, USA. He died in 1960. William J. Denbow was born in 1853 at Monroe, Ohio, USA. He appeared on the census of 9 July 1860 at Summit Twp., Monroe, Ohio, USA, as son.2 He married Sarah Elizabeth Baker on 25 August 1875. William J. Denbow married Mary E. McGurk on 14 June 1899.1 William J. Denbow died on 10 July 1926. [S165] 1860 U.S. Census, 700 Pennsylvania Ave., NW, Washington, District of Columbia, USA, Summit Township, Monroe County, Dwelling# 14, Family# 14.